Raith Rovers players can make amends for letting the club down by getting promoted via the play-offs. That was the rallying call from captain Euan Murray after the Kirkcaldy side threw away a two-goal lead to lose 3-2 to Stranraer at Stark’s Park on the day Arbroath clinched the League One title. With eight defeats, Raith have lost a third of their league games since John McGlynn returned in September, but Murray insists the players must shoulder the blame and look to put it right in the play-offs. “It comes down to professional pride, and for me, it’s not been good enough this season for this football club,” he told the Press. “As one of the players I hold my hand up. The responsibility lies with us. “We can’t be any more organised when we go onto the pitch, but if we don’t turn up, then it’s the players that are letting the club down. “We’ve just not learned our lessons at all and it’s so, so frustrating. “You get yourself into a position where you’re 2-0 up and then just as we’ve done all season we shoot ourselves in the foot. “It’s just not good enough, it’s as simple as that, but we’ve got three games left and then the play-offs so there’s so much for this club still to play for. “Again, we just need to try and learn, put it to bed and go again. Raith players slumped down the tunnel on Saturday with boos ringing in their ears, and Murray admitted the fans deserve better. “I don’t blame the fans at all,” he said. “As a player I can only say ‘fair enough’. It’s deserved and we just need to take it on the chin. “Of course they’re going to be upset - it’s not the first time we’ve let them down this season - but we’ve still got so much to play for, and their backing at times this season has really helped us. “It’s a bad one today, but as a footballer you need to keep your head up, put your shoulders out and move forward again. 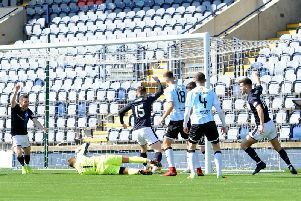 Saturday’s defeat again dented the belief that Raith are good enough to earn promotion, but Murray is taking confidence from the sporadic good performances. “We’ve shown over the course of season, for all we’ve let ourselves down sometimes, when the bigger challenges have come we’ve risen to it,” he said. “Look at Dunfermline out here, and Hibs away, when we played some really good stuff at times. When it comes to important games we seem to turn up for them more than others. It shouldn’t be that way but it has been the case this season. Murray has extra personal motivation to want promotion - it’s the only way to guarantee he will remain at the club he has grown to love. “I’m under contract but there’s a thing where we need to speak at the end of season and re-evaluate things,” he said. “We don’t know too much, but where the club is in terms of next season, will depend on what it’s going to be doing going forward. “There’s a bit of uncertainty, but it was probably like that last year as well. As a player, that’s in the back of your mind. “I’m just thinking about doing my best for the club in terms of getting them up. “I love it here, it’s probably the two years of my career I’ve enjoyed the most, which kills me because of how frustrating it’s been at times. “I really like the club, the fans have taken to me quite well, and I like being about the place. “I feel I I’ve come on massively under two different managers in two years, and I’ve really enjoyed myself, but it’s all down to what’s going to happen next season.